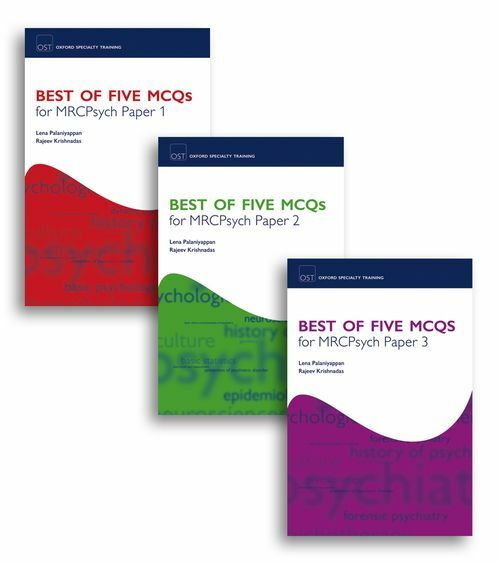 Following hot on the heels of the launch of the new syllabus and new MRCPsych exam in Spring 2008 by the Royal College of Psychiatrists, this pack contains books covering papers 1, 2 and 3 of the exam. Each book contains relevant MCQs for each paper. Supporting these MCQs are detailed explanatory answers and revision notes, referenced to the key textbooks used by trainees. The books' content is closely matched to the MRCPsych syllabus and includes practice papers for true exam preparation. Lena Palaniyappan is an academic clinical fellow at the Division of Psychiatry, Newcastle University. He is a gold medallist in undergraduate Psychiatry. He was awarded the coveted Laughlin Prize for outstanding performance in MRCPsych (Autumn 2007). He has been closely involved with the MRCPsych exams and has co-authored a book for the old format exam in 2004. He has contributed to various revision courses and online courses for the MRCPsych exam practice. He has conducted regular workshops for candidates taking MRCPsych exam at various places including Nottingham, Derby and Newcastle. He is a co-organiser of the reputed SPMM revision course for MRCPsych. His main academic interest is in exploring the neurobiology of psychiatric disorders using neuroimaging techniques. He is involved in a research programme at the Division of Psychiatry at Newcastle University.